Last week was a bit of a stressful week. It was the first week back from vacation, which always results in the vacation blues, particularly as I went from tropical Jamaican weather to wintery DC weather. On top of that, last week was also the State of the Union address, which as I mentioned is always a big deal for me and definitely means more work. And, if all of that wasn’t enough, my new Boss, Bigger Boss, and Big Boss officially started on Thursday. This is my first time working in an office where new management has taken over. I can’t begin to explain how happy I was to come home from vacation to find out I was going to keep my job, since that was an unknown when Hubby and I left for Jamaica. But, to be honest, it wasn’t until this week that I realized the transition to new bosses is all of the excitement and anxiety of starting a new job, just without the added difficulty of having to meet new coworkers. So, by the time Friday rolled around, I was exhausted and ready for some wine and relaxation. While Hubby and I tried to figure out what was for dinner, it occurred to me that January was almost over and I was at risk of missing one of my wine goals for 2012…and on the first month of the New Year! Thankfully, I had a bottle of kosher red wine on my rack to help save the day, but it meant that dinner was decided based on my need to taste a kosher wine. 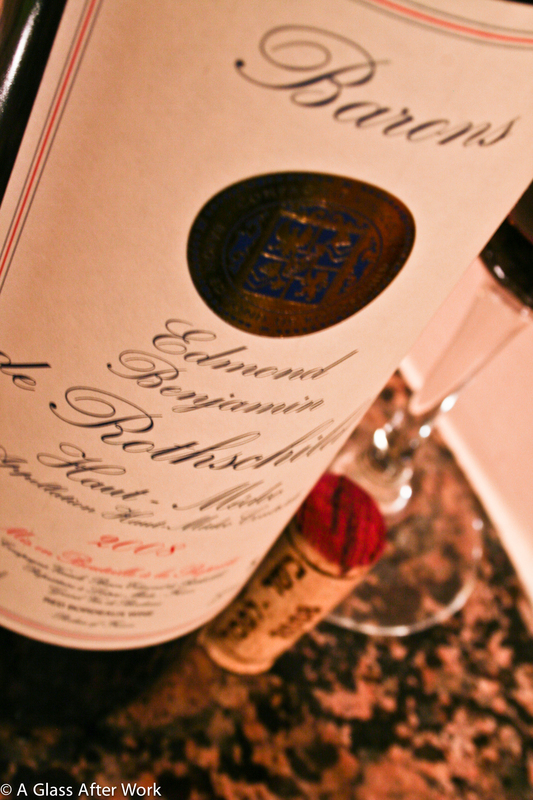 The 2008 Barons Edmond et Benjamin de Rothschild Haut-Médoc was a deep purple with hints of ruby. On the nose, there were blackberries, cherries, cloves, and a hint of vanilla. In the mouth, there were blackberries and cloves mixed with a hint of cedar and vanilla. The wine was very dry with medium-to-high tannins and medium acidity. Is this worth a glass after work? Definitely! If you see this wine in the store, grab it; you won’t be disappointed. At $32, this wine was definitely a good food wine, but on its own it was just a mediocre Bordeaux that clung to my teeth in an almost annoying way. I ended up pairing it with chicken that was marinated in a garlic, herb, and wine mixture, steamed broccoli, and brown rice. The food pairing toned down the wine’s clinginess and helped give it character that it was missing on its own. 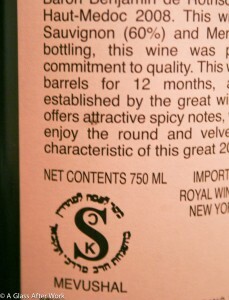 Question of the Day: Have you ever had a kosher wine? What were you thoughts on it? 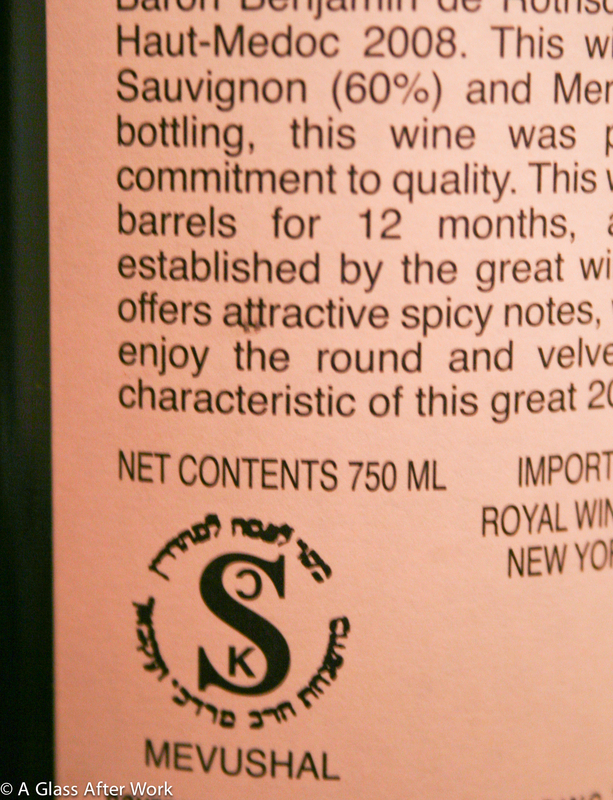 I recently had a Rothschild blend–it was a Chianti and Sangiovese blend. It was pretty good with the food I was eating but not quite as enjoyable to sip without food. I don’t know why. Maybe the Chianti part was overpowering? I’ve found that, in general, Chianti is a wine that I just prefer to drink with food. It’s too acidic for me otherwise. Food seems to temper that, though, and make the wine more enjoyable. I’ll have to see if I can find the Chianti here. I’m definitely intrigued, and any excuse to have some spaghetti and meatballs is a good one, right?